Cingular rolls out BIS 2.0 & Unl Price drop! How does this new plan affect tethering? Is the new plan truly Unlimited? PIN: No thanks, yo tienen una pluma. Blackberry Tethering Plan with Cingular! Be more specific. What do you need Gmail to do that it doesn't do already? 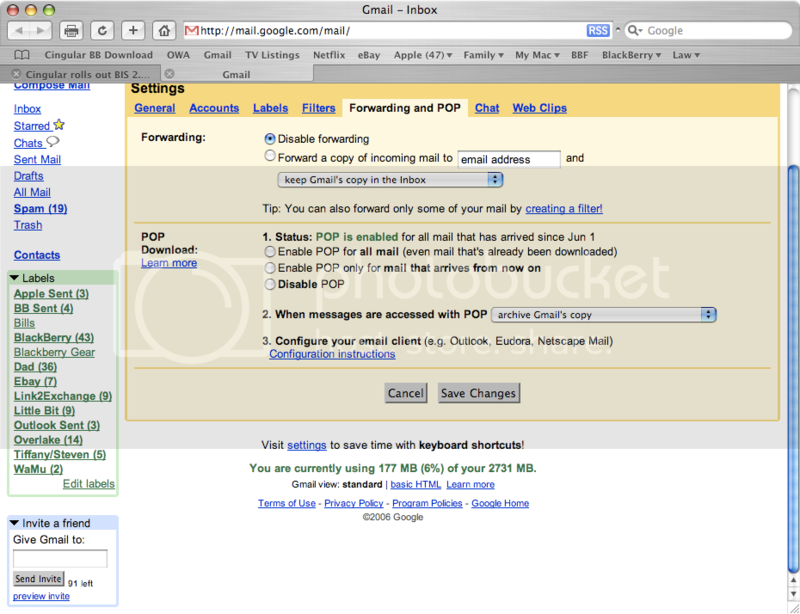 If a pop client pulls mail from my gmail account, the other pop clients I use don't see it. It's as if gmail is marking something read for me, which I don't want -- shouldn't the client be the one evaluating if something should be downloaded? I know my requirements are a corner case, but I haven't seen this issue with any other pop implementations. That's why I call it braindead. thats a lot of extra stuff.. any idea what they all mean? Hmm its funny but i have never used the website to view my bill as my COU line is free and my ERP lines i just have another rep tell me what i owe. If you could tell me what it says on your actuall paper bill i could tell ya easily! i still don't understand the yahoo partnership... gmail seems like a lot more popular route to take if you're going to support a fully synchronized consumer webmail solution. I don't know if this is related, but isn't everything by Google still in Beta? Will users currently on the $44.99 unlimited plan be automatically dropped down to the lower rate or will they have to wait until their current contract expires? No like any rate plan or feature the company will not change it for you. Wether its an increase in price or decrease. Its just a feature so you can have it removed then when its added back on it will be at the new price! CSP says, launch is June 12th for the new BB plans. Wow...is it me, or has this thread become about 8 different things since its inception? Nah, its only like 6 Pizzle. Welcome to blackberryforums.com. I'm just waiting for the obligatory post about downloading ringtones. Only then will the thread be complete. I have this awesome WAV that I want to use as a ringtone, but it's 65MB. How do I do that? From what I heared is for users of BES the price will remain as is. The price changes will only effect BIS. No one has confirmed to me if this will be automaticaly applied to current BIS users and in my opnion, like was said about Cingular's rigid billing system, one would need to call in or speak to a rep to get the new SOC as I beleive CIngular has no way of knowing who is who based on the info they have on all current users. I'll admit it's VERY hard to follow this thread, so if the answer to my question is here ... I'll apologize in advance. Was it ever determined if the new reduced-price unlimited plan applies to people on BES? If it does, what's that purpose of the current $45/month plan. Is it just going away (hopefully)? Check out these screenshots I just took. Look at number 2 under POP Download. 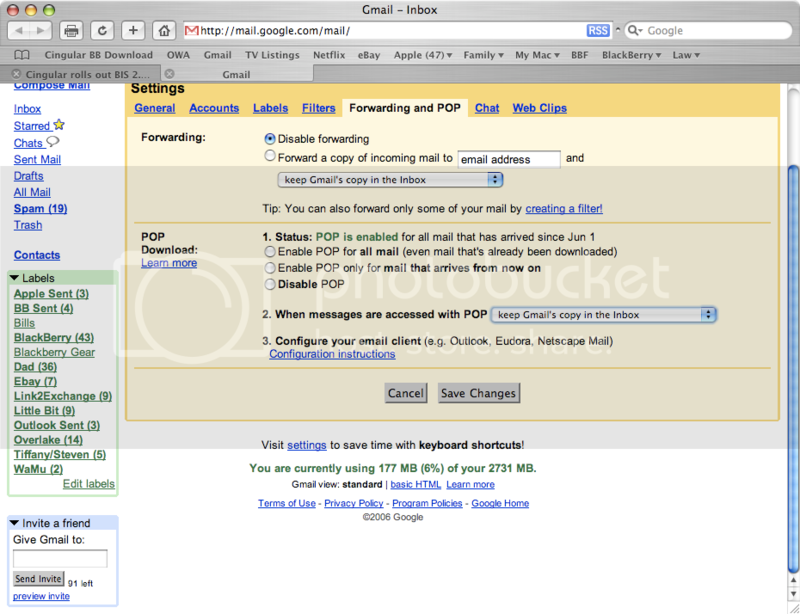 You can set Gmail to either keep it in the inbox after being pulled by pop, delete it, or archive it. So I guess the issue has been fixed. Last edited by Seattle18 : 06-06-2006 at 04:49 PM.